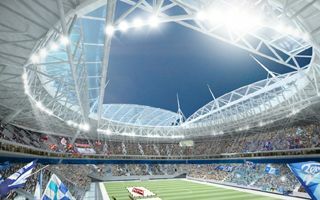 According to Russian Kommersant daily, the city of Saint Petersburg is facing significant spending on the surroundings of Zenit Arena. The stadium on Krestovskyi Ostrov will have landscaping works worth RUB 1.795 billion ($26 million). Although it sounds like a lot, the budget includes internal roads and pedestrian paving, not only public green areas. These works will be carried out by Leokam by late 2017. At that time the subway station near Zenit Arena (new Krestovskaya) should also be nearing completion. Construction work on the stadium’s retractable roof is finally nearing completion. On Friday the 11th segment was lifted into place, while the final 12th one should be done today, mounted in place by April 1. With the two semi-domes structurally ready, installation of the roof sheets will be able to commence. Completion of this phase is important, because two crawler cranes will finally leave the future field. This way work on the sliding pitch system would begin inside the stadium.